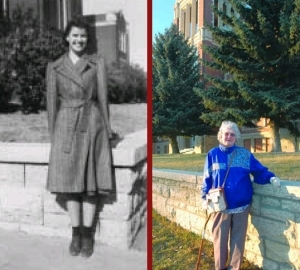 Tolley, then Marion Affleck, attended Central Collegiate and graduated in June 1941, but it was only thanks to the Rotary Club’s charitable donations that she was able to pay the fees. “I was so thankful to be able to go to school,” she said. “As far as I can remember, it cost $12 or $15 to register and my family could not afford it. “I did not find out for about 40 years who had paid it. It was the Rotary Club of the day. It was when the drought and the Depression were still on,” she said. Tolley, now 86, was 18 the June she graduated, but she said there was no fancy party like students have these days. “I think we just had something in the school auditorium, but we did not have fancy outfits or a dance or anything,” she said. Everybody used to walk to school back then, even in winter. “ We used to share books a lot and even share clothes,” she said. “ We had a lot of elocution and spelling contests with the schools. “ We had quite a lot of music events although most of us could not afford real music lessons. “ We had a great teacher — an Irish man — and every year we had a special program called an Irish Night, and we all sang and danced,” she said. After high school, Tolley attended the Davidson Business College, which was on the top floor of the Royal Bank on High Street. She met her British husband, George Tolley in Moose Jaw where he was a transport driver for the Royal Air Force. They got married in 1943 and she travelled on a ship with other war brides to join him in England briefly before he was sent to Burma. Tolley worked for the Royal Canadian Air Force as a clerk in Worcester, U.K., and came back to Moose Jaw in 1946. She said many Moose Jaw girls married British servicemen and most of them returned to the city after the war. Tolley, who has seven children, 10 grandchildren and one great-grandchild, said she is not in touch with many old school friends. “ The war broke us up,” she said. “Some of them never came home because they were killed and some moved someplace else. “ I am looking forward to the reunion and hoping some of the oldtimers will come back. It will be good to see some I have not seen for a while,” she said. Rebecca Lawrence can be reached at 691-1258.